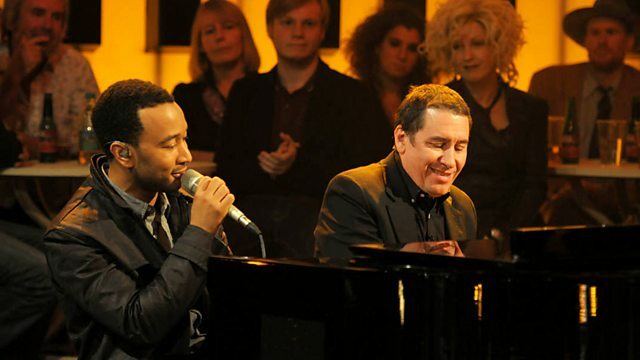 Joining Jools are The Ting Tings, Cyndi Lauper, John Legend and Imelda May. Plus Antony and The Johnsons return to the show to perform tracks from their new album Swanlights. Joining Jools on the fifth show of the series will be: The Ting Tings, who return to the show to perform tracks from their brand new second album; and Cyndi Lauper, who first came to the attention of pop back in 1984 with her debut Girls Just Wanna Have Fun, will be in the studio to perform a song or two from her new blues album Memphis Blues. John Legend, who has just released a collaborative album with The Roots entitled Wake Up, will be playing a couple of tracks from that with his own band; Dublin's own Imelda May performs numbers from her new album Mayhem; plus the UK born, New York-based, Mercury winning Antony and The Johnsons return to the show to perform tracks from their new album Swanlights.